getcalc.com's Present Value (PV) Calculator is an online finance tool to calculate present sum from the future sum at a specified date by applying continuous discounted rate of interest. 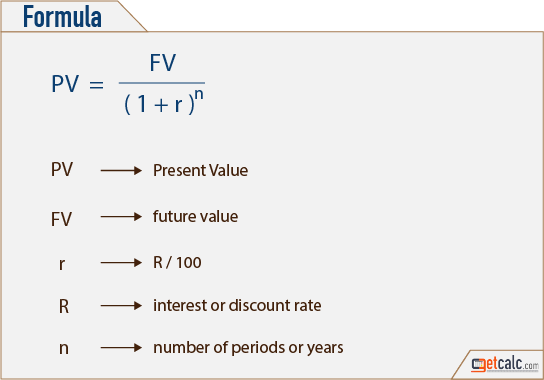 Present Value is a finance function or method used in the context of time value of money calculation, also known as discounted value, often abbreviated as PV, represent what is present value of future sum. In other words, a time value of money that will be discounted from the future value of specific date to get the present value of a given date. The higher discount rate reduces the present value significantly.